People in Shamattawa had the unusual sighting of spotting of a polar bear in town over the weekend. 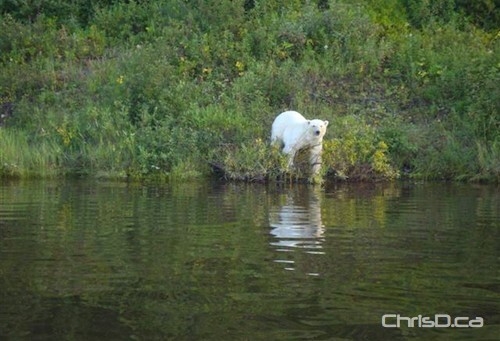 RCMP say at around 6:30 p.m. on Sunday, a lone polar bear was found swimming in the river. Police launched a patrol boat to monitor the animal until darkness fell, when it left the area. Elders in the area told RCMP that this was the first time seeing a polar bear in the area. Manitoba Conservation was notified and will be watching for the bear if it returns. No injuries or damages were reported in relation to the bear sighting.